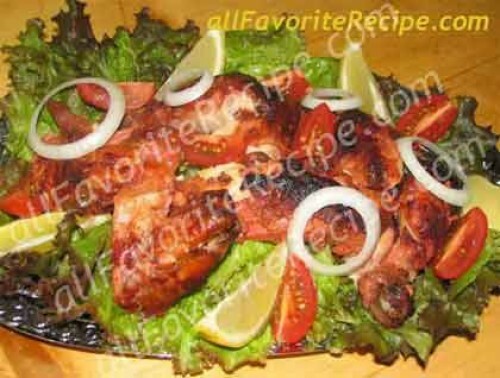 I got this tandoori chicken recipe from one of my Asian chicken recipe book. They said that tandoors from the word tandoori chicken, is a clay oven used in cooking and baking specialty foods at high temperature. Tandoor is used for cooking certain types of Afghani and Indian food such as this chicken tandoori, chicken tikka and other bread varieties. Anyway, after cooking this tandoori chicken, the aroma and flavors of the chicken stand out and with rice with it, we love it. Preheat oven to 375°F. Prepare a roasting rack and a baking dish. Set aside. Rinse chicken inside and out and pat dry with paper towels. Make deep gashes in thighs and on each side of breast. Pin back the wings. 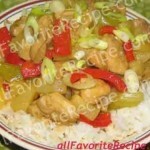 Place chicken in a non-reactive bowl. Set aside. Combine tandoori curry paste, yogurt, lemon juice and melted butter. Stir to blend. Spread mixture all over the chicken, rubbing well into the gashes. Cover and refrigerate for 6 or more hours. 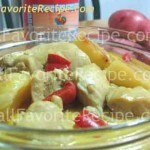 Place chicken on the prepared roasting rack in a baking dish. Spoon any remaining marinade over chicken. Transfer and place in the center rack of the oven. Bake for an hour or until chicken is done, basting with pan juices every 15 minutes during cooking. Internal temperature reads 160°F for the leg, 180°F for the breast and 190°F for the thigh. Be careful not to touch any bones with the thermometer. Bones conduct heat and will give a false reading. Remove the chicken from the oven and transfer to a cutting board. Cover with aluminum foil for about 10-15 minutes before carving so the juices settle. Arrange crisp lettuce leaves on a large serving platter and cover with onion rings. Cut chicken into portions and place on the platter. Garnish with tomato wedges and lemon slices. Chicken portions (choice cuts like breasts, legs, drumsticks and wings) may be used instead of a whole chicken. Just turn frequently while they are roasting. Have You Tried These Other Healthy Chicken Recipes? I love Chicken tandoori recipe thank you please share more Chicken tandoori recipe. I have written a similar recipe recently. But your recipe is too good mine. Thanks for sharing.